Something for the entire family. Custom cars, bikes, and more. 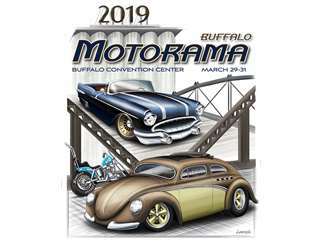 The 2019 Buffalo Motorama fueled by Basil Family Dealerships is held Friday March 29 through Sunday March 31, 2019 at the Buffalo Convention Center. The Buffalo Motorama is the Premier Indoor Car and Bike Show in Buffalo, New York featuring the best rare and original muscle cars, high end exotics, customs, tuners, and race cars all under one roof. Multiple builders from across the USA and Canada will be there displaying their latest builds as well as hundreds of other show cars and bikes. The Open Wheel and Hot Rod Room is filled with hot rods, pinstripers, and live bands throughout the weekend. It is a show within a show. Get your picture and autograph with Luke Duke (Tom Wopat) from the Dukes of Hazzard and the General Lee. Meet automotive tv celebrities Dennis Gage from My Classic Car, Lou Santiago from CarFix, and Dan Woods from Chop Cut Rebuild. See a custom bike built by Orange County Choppers. Meet your favorite characters from the Star Wars on Saturday and Sunday. There will be something for everyone. The Motorama Marketplace features vendors selling housewares, jewelry, clothing, and massages. The event is $15.00 to spectators at the door. 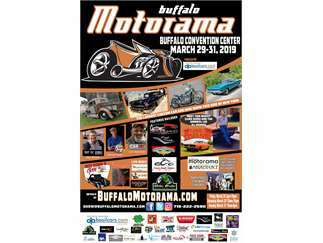 Tickets are purchased at the Buffalo Convention Center Box Office, online at www.buffalomotorama.com or at Tops Markets or Wegmans. Discount admission to active and retired military. Kids under 11 free with each paid adult admission. For more information, visit www.buffalomotorama.com or www.facebook.com/buffalomotorama . Show hours are Friday March 29 2pm-10pm, Saturday March 30 10am-10pm, and Sunday March 31 10am-6pm. Cost: The event is $15.00 to spectators at the door. Tickets are purchased at the Buffalo Convention Center Box Office, online at www.buffalomotorama.com or at Tops Markets or Wegmans. Discount admission to active and retired military. Kids under 11 free with each paid adult admission.